January 2-6| Online Dispute Resolution (Sacramento) –Professor in a law school class for the McGeorge Law School, University of the Pacific. 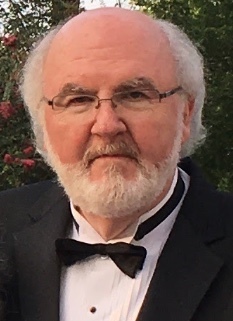 November 30-December 2 and December 7-9| International Dispute Resolution (Dallas) – Professor in a graduate class for the Dispute Resolution program at Southern Methodist University. November 14-15| International ODR Forum (Auckland, New Zealand) – Panel Moderator on ODR Standards. October 17| ABA Mediation Week Human Library (DC) – Human Library Participant. October 9| DC Legal Hackers (DC) – Open Discussion on ODR. October 4| Association for Conflict Resolution Annual Conference (Pittsburgh) – Panel Discussion: ODR Ethics. 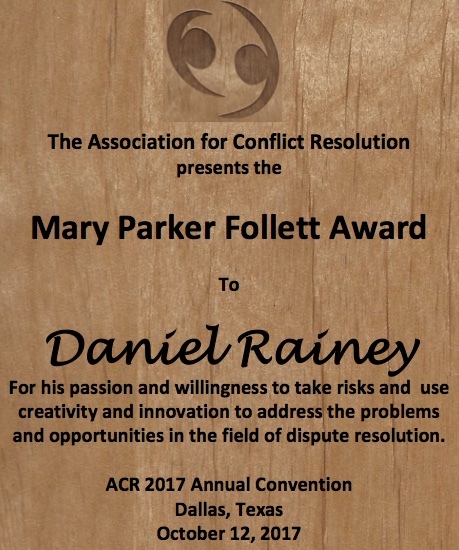 October 3-6| Association for Conflict Resolution Annual Conference (Pittsburgh) – Presentation of commentaries related to the ACR/AAA/ABA Model Rules for Mediators. August 29| Tennessee Bar Association Equal Justice Conference (Murfreesboro, TN) – Presentation on ODR and Self-Represented Litigants. August 23| Foreign Service Institute (Arlington, VA) – Presentation on careers in mediation (NVMS). December 11-12 | (Denver, CO) Meeting of the National Center for State Courts (NCSC) ODR Technical Standards Working Group. December 8-9 | (Memphis, TN) Basic Mediation Training for the Veterans Administration Social Workers. November 3-5 and 17-19| (Plano, TX) International Dispute Resolution – Professor: Graduate Class for SMU. October 23 – December 17| (Online) Online Dispute Resolution – Professor: Graduate Class for Dominican University. October 17| North Carolina Dispute Resolution Commission Webinr (Online) – Online Dispute Resolution presentation. September 24-26 | National Association of Railroad Referees (NARR) (Chicago) – Participant on a panel addressing railroad grievance arbitration. July 10-13 | World Justice Forum V (The Hague) – Panelist discussing a digital identity project for refugees. June 12-13 | ODR Forum (Paris) – Member, Forum Planning Group, Panel Chair and Panelist for Forum sessions. April 27-28| American Law Institute CLE (DC) – Participant on a panel addressing labor and employment practice in the airlines and railroads. April 20-22| ABA Section of Dispute Resolution (San Francisco) – Participant on a panel addressing technology and mediator ethics. April 5-7| ABA Labor and Employment Law Section Midwinter Meeting (DC) – Participant on a panel addressing online dispute resolution. March 30| The Mediation Room Master Class (Online) – Interview with Graham Ross as part of a Master Class in Online Dispute Resolution – recording available. March 15-18| ABA Tech Show (Chicago) – Participant in a hack-a-thon to support veterans access to justice. March 8-10| ABA Railroad and Airline Committee Midwinter Meeting (Sonoma, CA) – Participant on a panel addressing dispute resolution in the industries. March 7| InterAgency Dispute Resolution Working Group (DC) – Workshop – “Teleconferencing and Videoconferencing for ADR.” – Recording available. February 17-19 and March 3-5| (Plano, TX) Negotiation – Professor: Graduate Class for SMU. January 30 | Section 3 Meeting (Hollywood, FL) – Participant on a panel addressing railroad grievance arbitration. January 19| (Richmond) – Virginia State Supreme Court Access to Justice Commission, Self-Represented Litigant’s Committee, Committee Meeting [Bi-Monthly throughout 2017]. January 4-8| McGeorge Law School (U of California) (Sacramento) – Online Dispute Resolution course. January 2017| Publication of The Handbook of Mediation: Theory, Research, and Practice by Routledge Publishers. November 1| CyberWeek – Webinar on ADR, ODR, Technology, Ethics and Practice – with Leah Wing. October 24 – December 18| Online Dispute Resolution (Dominican – Chicago) – Professor: Graduate Class for Dispute Resolution Masters Program. September 19-23 | National Association of Railroad Referees (NARR) (Chicago) – Participant on a panel addressing railroad grievance arbitration. April| Publication of “Building the Justice Layer of the Internet,” ABA Litigation Journal, Summer 2016, Vol. 42, No. 3, pp. 42-45 – Jeff Aresty, Robin West, Daniel Rainey. October – November| Центр медиации и права [Center for Mediation and Law, Moscow] (Russia) – Webinars on “Practical Technology Tools” for divorce and family mediators. August 24 – October 11| Creighton University (Omaha) – Online ODR Course. August 5-6| Federal Dispute Resolution Conference (Phoenix) – Working With Teams at a Distance. August 4| Publication of “Leveraging Technology in the Ombudsman Field: Current Practice and Future Possibilities,” Journal of the International Ombudsman Association (JIOA). May 4 – June 21| Creighton University (Omaha) – Online ODR Course. January 12 – March 1| Creighton University (Omaha) – Online ODR Course. October 20 – December 14| Dominican University (Forest Park, IL) – Online ODR Course. October 11| ACR 2014 Annual Conference (Cincinnati) – Panel Presentation: Creating Success in High Stakes Mediation. October 10| ACR 2014 Annual Conference (Cincinnati) – Panel Presentation: Cross-Border Consumer Online Dispute Resolution: The Next Big Thing. June 2-3| Canadian Council of Administrative Tribunals (Ottawa, Canada) 2014 Annual Conference – Plenary Speech: Technology and Online Hearings: ADR and Mediation. May 22| Civil Mediation Council 2014 National Conference (Leeds, UK) – Plenary Presentation: Mediation and Technology. May 21| Center for Australian, New Zealand and Pacific Studies, The Global Leadership Program, USA – Panel Presentation: Innovation in Government. April 29| Skills for Justice: Dispute Resolution for the Nation (Hosted by the Welsh Government) 2014 (Cardiff, Wales) – Plenary Presentation: ODR Techniques in the Workplace. April 4| ABA Section of Dispute Resolution (Miami) 2014 Annual Conference – Panel Presentation: How the Fourth Party Affects Mediation Ethics. April 3| ABA Section of Dispute Resolution (Miami) 2014 Annual Conference – Panel Presentation: Building an Online Justice System.